I spot­ted an old man sit­ting in a crowded bazar, sewing army and police patches onto uni­forms. I hag­gled and picked up a dozen. I had an unusual expe­ri­ence, doc­u­mented in Good­bye Jalal­abad http://www.jalalagood.com/2011/05/goodbye-jalalabad/ where I actu­ally saw a crate of Afghan Army Uni­forms fall of the back of the truck and spill on the road. You’ll have to read the post though, to learn what hap­pened next. 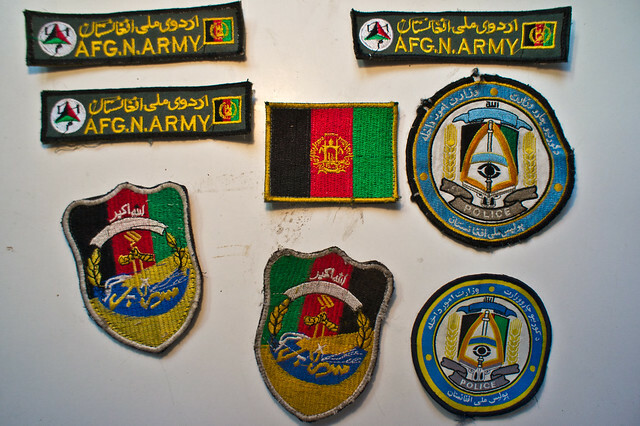 I know I might be a bit late for the party, but do you still have any for sale, espe­cially one of those AFG.N.ARMY patches?